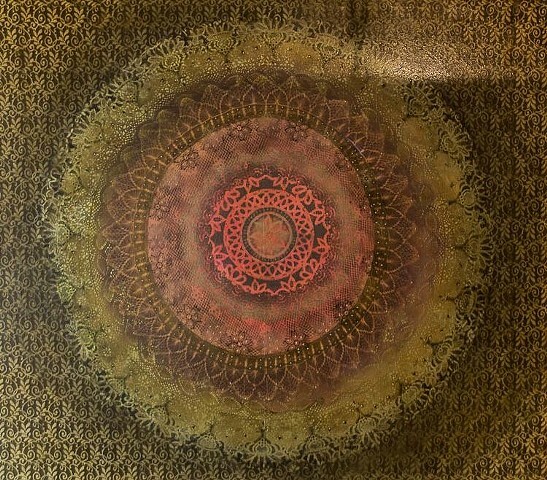 Gruen Galleries - Rosada Love "Love Mandala"
During Jesus's travels to Thailand Jesus encountered "Mandalas" or Buddhist spiritual art created in sand. The Buddhist monks would painstakingly create these beautiful "Mandalas" for months at a time. In the end they would destroy these creations and place the sand in local rivers or streams in a religious belief that all life is recycled and reborn into nature. Jesus's "Mandalas" are created with a similar spiritual belief but he believes the beauty should be saved through his "Love Mandala" pieces.